Plus! Learn to play BB King, Radiohead, Free, Oasis and more! 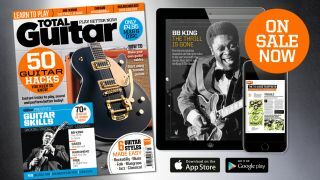 Total Guitar issue 290 is on sale in print and digitally from today. This month, we’ve compiled decades of experience into 50 time saving tricks to help you sort out your gear, play better, perform live and record easily! With our hacks, you’ll find ways to instantly improve with little to no practice! TG features more song tabs and audio than any other UK guitar magazine, complete with studio-quality backing tracks on your CD!